Gastric cancer (GC) is the fourth most common cancer in the world and the second leading cause of cancer-related death. In Australia, the age standardised incident rate (ASR) is 9-10 per 100,000 people and over 11,000 deaths were recorded between 1996 and 2006. The current diagnostic strategy for GC is inadequate. The ability to detect early stage GC increases the expected five-year survival rate (5-YSR) after symptoms of GC appear from 10-30%, to a 5-YSR for those diagnosed at early stage GC >50%. A reliable, cost-effective screening test for the early detection of GC therefore has considerable clinical potential. Particularly in geographic regions including China, Hong Kong, Japan, Korea, Central Europe, Scandinavia, South and Central America and Russia which have a far higher incidence of and mortality from GC. These four markers can be combined for a rapid and cost-effective screening test for GC. Patients identified as at risk using this test can be referred for endoscopic biopsy and histopathology. The potential applications of this technology are in the development of a viable rapid and cost-effective diagnostic test for early stage gastric cancer. This technology will therefore be of interest to companies in the diagnostics field, already have a presence in the gastric or oncology space or who manufacture ELISA kits and wish to enter the diagnostics market. ARI filed a National Phase patent application "Biomarkers for Gastric Cancer and Uses Thereof" in September 2014 in multiple jurisdictions to protect this technology (WO2013106886A1). Copies of this application are available on request. This technology is commercial ready. We are therefore interested in enquiries and expressions of interest from potential partners and/or prospective licensees. This technology is for four (4) serum biomarkers that are potentially useful as part of a diagnostic screening test for early stage GC. 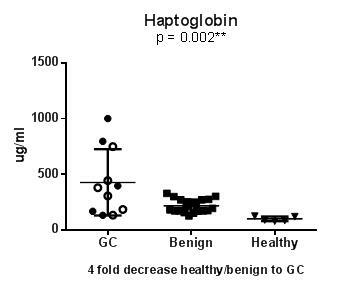 Serum samples were obtained from preoperative GC patients with intestinal type gastric adenocarcinoma (according to Lauren classification). This included early-stage gastric cancer (AJCC 6th Edition Stage I disease, with minimal depth of invasion into mucosa and no metastatic lymph nodes). 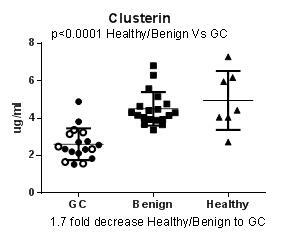 These were compared with non-metastatic benign gastrointestinal disease serum samples which were non-metastatic. These in turn were compared with healthy control samples. All clinical data was collected by gastroenterologists and stages conformed by histopathology. Clinical information regarding gastritis status and H. pylori infection and atrophy were also obtained in all samples. 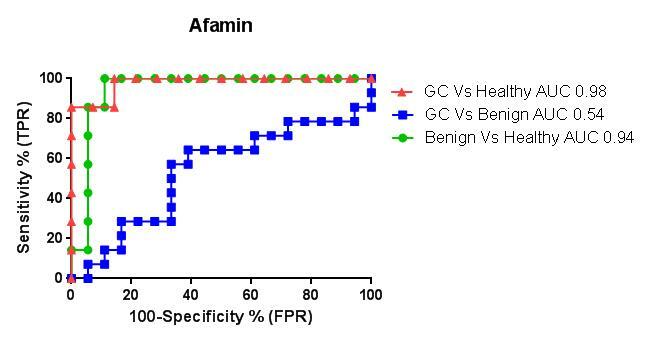 Figure 1A to 1D: Graphical representation and ROC curves of analyses comparing serum from patient with gastric cancer including early stage (open circles), benign gastrointestinal disease, and healthy serum, comparing the three combinations, indicating accuracy (AUC), true positive rate (sensitivity) and false positive rate (100%-specificity). 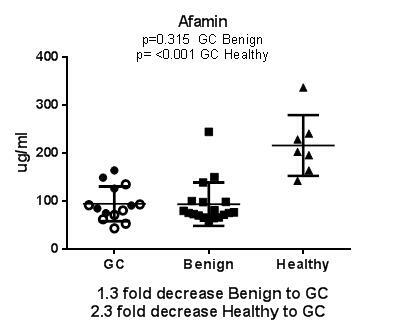 Furthermore, the levels of these four serum proteins in the 11 early stage GC samples were indistinguishable from those in the advanced stage GC samples (Figures 1A-D, open circles). 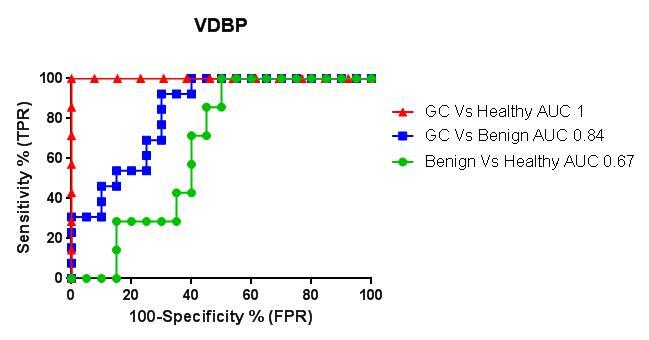 Collectively, these findings suggest that these 4 proteins could service as promising biomarkers for the detection of early-stage GC. Existing clinical biomarkers (CA 19-9, CEA and CA 72-4) are neither sufficiently sensitive nor specific for routine screening and are primarily used to monitor disease progression. The sensitivity of CEA, CA19-9 and CA72-4 has been estimated to be as low as 33% in patients with GC across a number of studies, making them unsuitable for early detection. 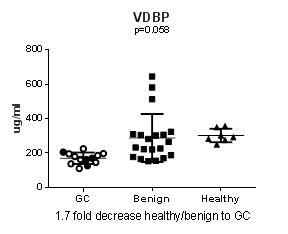 In comparison, the 4 biomarkers we have identified for early GC and that we wish to take into Phase II of a Biomarker Trial have been shown in literature published by our group to more accurately segregate GC patients from healthy controls (Penno et al., 2012 J Prot 77:40-58). We have established a strong collaboration with the National University Hospital in Singapore and now have access to serum from both early and late stage gastric cancer patients as well as from benign gastrointestinal disease patients, which can be used as controls. We are currently performing further assay validation of this large sample cohort and expect to have further results regarding the biomarkers' sensitivity and specificity in the South East Asian sample during 2015. The potential applications of this technology are in the development of a viable rapid and cost-effective diagnostic test for early stage gastric cancer. Patients identified as at risk using this test can be referred for further assessment through endoscopic biopsy and histopathology. This will allow for earlier detection and treatment of gastric cancer and reduce the number of patients who are unnecessarily sent for invasive and expensive endoscopic assessment.